New Hampshire probably isn't the first place you think of when you think skiing. Yet, the White Mountains give it some of the best ski terrain in the east. Most of the resorts aren't far off the highway or outside a major city making them easy to get to. 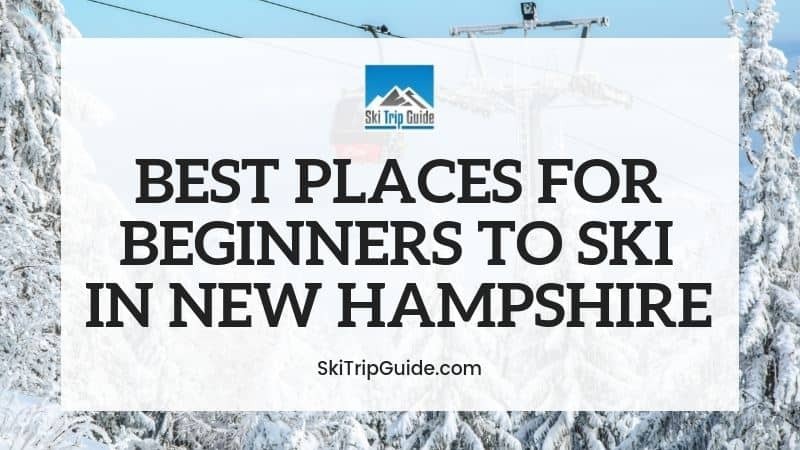 If you're a beginner, New Hampshire just might be the perfect place to learn the sport. Here are 5 resorts you must check out if you're learning to ski in New Hampshire. Cranmore was built in 1937 at the time the area was first being promoted a ski destination. They opened the 2nd ski school in the area focused on teaching people the sport. Unlike other eastern resorts, they were the first to build wide open trails like those of Austria. Perfect for beginners. Today they offer 170 acres of skiing. A lot of history, and a lot of fun! There are 16 easy, green trails for beginners to learn to love the sport. Cranmore has a Beginner Basin area for anyone just learning to ski. It's a self-guided progression area. Inside are 2 magic carpets. For a little more help building your skills, try a lesson with certified instructors. Reserve online in advance for discounts. Private Lessons - Ages 6+ booked as private or semi-private (up to 3). One 90-minute lesson or a 3-hour lesson. KidsRule Mountain Club - Lessons by age and skill level beginning age 3 to 14. Full & Half Day. To view packages and rates or to book, visit their website. Cranmmore offers state-of-the-art ski equipment rentals designed to help you learn to ski. View their rates and a video on their rental experience here. Not only is there a snow tube park, but Cranmore has been rated #1 for off-hill action because they also offer a mountain coaster, swing ride, and zip line. Fitness Center - Personal training, weight room, yoga studio, cycling classes, and indoor tennis courts. Grab a bite to eat or a drink at 6 restaurant venues. The resort you book will likely have additional amenities and activities to offer. The size is perfect for first-time skiers and families, not too big, not too small. The staff was amazingly helpful and friendly. The mountain has lots of great trails for skiers of all ages and had all types of activities for kids. Bretton Woods is New Hampshire's largest ski resort with 464 skiable acres. In 2018, Ski Magazine named them #1 in the east for grooming. Over the last 5-years they've achieved first or second place in snowmaking and grooming. They take pride in their space and want to ensure you have a great experience. Bretton Woods offers 22 beginner trails with plenty of variety to spread out, explore, and test your skills when you're ready. The Learning Center Quad offers 2 magic carpet lifts designed to help you get comfortable on your skis before hitting the chair lifts. If you're looking to build your skills and confidence, hit the slopes with one of Bretton Woods certified instructors. Adult Group Lessons - Grouped based on skill. Ages (13+). Offered daily for 1.5 hours each. Learn to Ski Lessons - Includes rental, a group lesson, and unlimited access to the Learning Center Quad. Ages 13+. Hobbit Program - Ages 4 to 12. Includes half & full-day programs designed to introduce them by skill and age. Check the latest pricing and book here. The rental shop opens 1-hour before the slopes, every day. They have everything you need for a day of skiing. Book your rentals online for a discount. The hotel you book will likely offer additional amenities. Very nice ski area for kids and families. Most of the slopes are fairly gentle. Their Learn to Ski package is fantastic for first-timers or those that haven't been on the slopes in years. Attitash Mountain Resort is the largest resort area on Mount Washington. They not only offer 311 acres of their own skiing, but they partner with Wildcat (20 minutes down the road) to offer even more skiing options. For beginner skiers, they offer a novice lift ticket giving access to beginner areas on both mountains. They even offer a snow guarantee. There are 19 easy, green trails at Attitash Mountain. Add in Wildcat for another 9 to explore. There is 1 magic carpet area in the Learning Center that was designed with beginners in mind. It's never too late to learn. Attitash has several programs for beginners doing just that. Advanced reservations for all ski lessons and programs are strongly recommended. View all options and rates on their website. The rental office is located slopeside in the Adventure Center. They offer both full and half-day rental packages. View rates here. There is no snow tube park at Attitash Mountain. However, you can take a ride down the mountain on the Nor’Easter Mountain Coaster. On the mountain, you will find 9 restaurant venues to enjoy. Otherwise, Attitash is mostly about the skiing. Attitash is a fun place to ski. They offer long, varied trails. The lines weren't long, and the people working on the mountain were fantastic. The learn to ski program is a great fit for first time skiers. King Pine and Purity Spring Resort is located near Boston making it a popular destination for skiers. They are known for being a family destination, having the longest running kids ski camp in the country. Ski day or night. This is the perfect location for a ski getaway. As a beginner, you will find 12 green slopes perfect for growing your skills. There is 1 magic carpet lift inside the learning area. Check their website for rates, availability, and to book. King Pine's rental shop offers one of the largest inventories in the area, including ice skates and snowshoes. Book multi-day rentals for deep discounts. Check their website for details. King Pine has a lift-serviced snow tube park. In addition, they offer a wide variety of other winter activities: sleigh rides, ice skating, and snowshoeing. Nice small mountain. This was the best place to learn how to ski. There are a good Variety of trails for all types of skiers. A fantastic spot to bring the family. Waterville Valley Resort has long been a popular ski spot for people traveling in from Boston. Back in the day, it even hosted members of the Kennedy family. They have even hosted various World Cup races. The Town Square offers a quaint, New England village center with restaurants and shopping. Everything you need for a great ski getaway. Waterville Valley may be a smaller resort, but they still have 9 easy, green trails. There are 3 magic carpet areas set up for beginners just learning to ski. Call to book your lessons in advance. Some programs offer discounts. Check the latest rates and availability here. The rental shop is conveniently located at the base of the mountain and fully equipped to buy lift tickets and set up lessons. Book your rentals for more multiple days and get a discount. Check the latest rates here. Waterville Valley offers more than just a snow tube park. They also have an indoor ice arena, dog sledding, fat biking, and snowshoeing. Athletic Club - cardio, weight room, indoor pool, indoor tennis, spa, sauna, steam room, and game room. If you are just starting out, this is a great place to go. The trails are wide compared to other local resorts. The mountains offer gentle slopes, and the staff is wonderful.